Kaffir Lily (Clivia) is very similar to Amaryllis. Like the Amaryllis plant this plant also grows on a large stem. The flowers grow in clusters around the top of the stem. The trumpet shaped petals have a very nice fragrance to them. This flower grows in an orange color with a yellow center. The leaves are a dark rich green color that grow like long spears shooting outward from the plant. 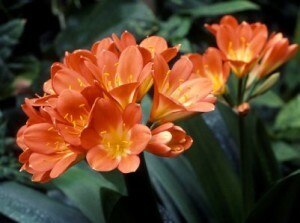 Clivia is a house plant that can grow from winter to spring. They grow from bulbs that can be planted in an everyday potting mix. When the bulbs are first planted keep them in a dark shady spot until the shoots begin to appear. Then you can place it in a sunny window. While the plant likes the sun, it does not like to be in direct sunlight. This is a very delicate flower. They are a little high maintenance. They like warm temperatures in the daytime and cooler temperatures in the night time. You have to make sure to water them regularly so that the soil is moist. They should also be fertilized every two weeks to keep them healthy and strong. Take care of this high maintenance plant and it will surely be worth it. It loks pretty and smells great!